This beautiful boy is Bandit. He's a 6 year old Shetland Sheepdog / Smooth Collie mix. He's at Wayside Waifs in Kansas City where he's stolen the hearts of animal shelter staff and volunteers. 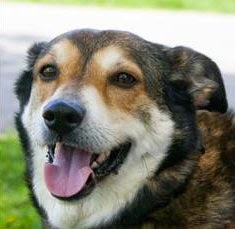 My name is Bandit and I am a beautiful 6-year-old Shetland Sheepdog/Smooth Collie/Mix and I am ready for my new Forever Home. I know you probably think six is old but I am far from old; I am "young at heart", have already made it through that puppy stage so I would say I am just about the right age. After all, older is better, don't you know? I was found as a stray and my owner was not able to take me back for personal reasons. I wish I could have stayed but sometimes people cannot take their dogs with them when their lifestyles change. That is what happened to me. 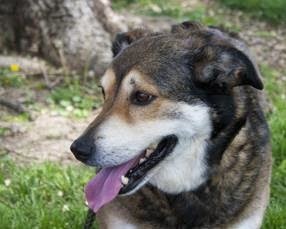 I was almost adopted but that fell through so fortunately I ended up at Wayside Waifs. How lucky for me because I know that I am safe while I search for my new home and family. When I first came to Wayside I was scared and very nervous but it did not take me long to steal the hearts of the Staff and Volunteers and now I am brave and happily ready for my new digs. Although I am over most of my fearfulness, I will still not be able to go to a home with kids under the age of 12-years-old. I know I would never purposely hurt anyone but I still am a little timid with strangers, so I ask that you please be patient with me. My Handlers know that I am such an awesome guy and that I will make a great addition to almost any home. I would prefer a quieter environment and even though I get along with some dogs it might be best that I go to a home as an only dog. I can be picky sometimes about my canine friends. I do great on my leash and I love to go for walks. I will stop sometimes so that you can give me a hug. I am housebroken so that will make things much easier for the both of us. I hope that I can find a family that will be patient with me as I learn the routine of my new home and is willing to help me with positive reinforcement training and socialization. I will need time to adjust to my new surroundings before I am introduced to others outside the home; I know you understand. I think I will bond well with my new family members; so if you are looking for a best friend, here I am. Well that just about covers everything; I hope you like what you read about me, and that you will come to Wayside to visit me. 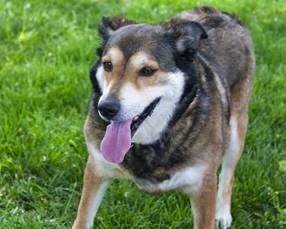 Please stop by the Adoption Desk and ask to see Bandit. I promise you will not be sorry. Oh and I forgot to mention, they call me Bandit because I will steal your heart. Talking Dogs blog will be participating in the Tuesday's Tails blog hop hosted by Dogs N Pawz and Talking Dogs. This is the blog hop that features shelter pets. Find a pet at your local animal shelter or rescue and join us! Hope you find a new home soon. Sharing. What a handsome guy....I love his colors! Sharing. Bandit is such a handsome dog. I agree with your other readers that he is the perfect age because he isn't a puppy and yet he still has many years left to be with a new family. Will share his story. Oh what expression! Hope he finds a great home soon! Bandit looks like a happy dog. Hope he finds the perfect home soon. Sharing. Bandit will steal anyone's heart! Sharing! Hope he finds a good home!